After publishing our recent Best Racing Harnesses article we were asked about harness options for daily driven street cars that are being equipped for track use. Vehicles which serve a dual purpose as both a track day car and a means of every day transportation have significantly different requirements than vehicles built specifically for racing. With that in mind, below are some considerations when selecting harnesses for your street car. Be sure to check out both our Racing Harness and Belts Buyers Guide and our Racing Seat Buyers Guide for a refresher on some other factors you need to consider when buying a racing harness and a seat to use it with (if needed), and head over to the Winding Road Racing online store to check out the entire selection of harnesses and belts available, as well as the selection of racing seats. 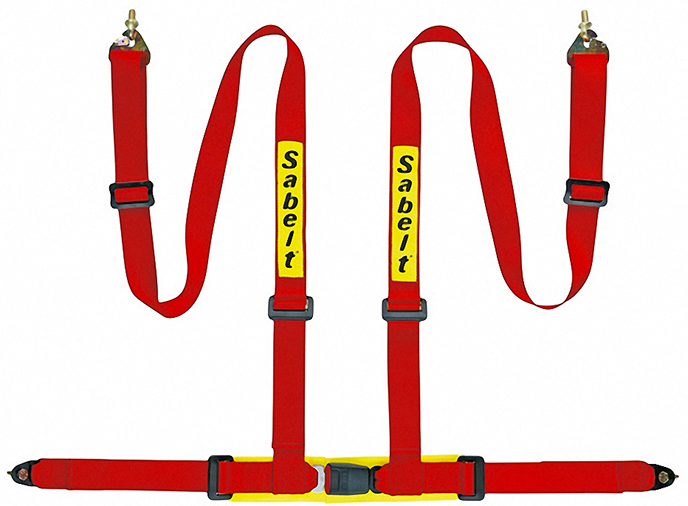 The Sabelt Clubman harness is designed to be used in street-legal cars that are also used for track days or other events which do not require full wheel-wheel safety gear. The Clubman has a conventional lap belt buckle to address laws in some states which prevent the use of the camlock or snap buckle used on racing harnesses. The Clubman is a four point harness (no anti-submarine belt) because many drivers find anti-sub belts inconvenient for daily driving. The Clubman lap belt must be bolted in to your car on either side of you seat, near or using the existing attachment points for your belts. The Sabelt Clubman shoulder harnesses should be attached to a roll bar or harness bar running behind the rear seats at shoulder level. This is done by wrapping the shoulder straps around the harness bar in between harness retention guide collars that hold them in place. Generally the Clubman should be used with aftermarket seats that have access holes for the shoulder belts (this avoids wrapping the shoulder belts over the seat back and putting a load, which the seat is not designed for, on the seat back mechanism). The Oreca Turn One Clubman harness is designed to be used in street-legal cars that are also used for track days or other events which do not require full wheel-wheel safety gear. The Clubman has a conventional lap belt buckle to address laws in some states which prevent the use of the camlock or snap buckle used on racing harnesses. The Clubman is a three point harness with no anti-submarine belt because many drivers find anti-sub belts inconvenient for daily driving. The Clubman lap belt must be bolted in to your car on either side of you seat, near or using the existing attachment points for your belts. 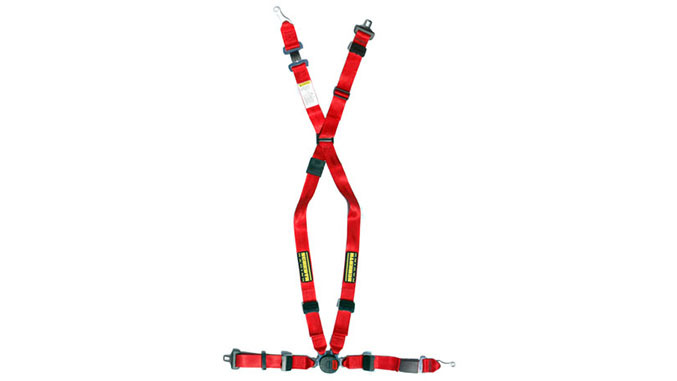 The Oreca Turn One Clubman shoulder harness can be attached in several ways. It can be attached to a roll bar or harness bar running behind the rear seats at shoulder level. This is done by wrapping the rear strap around the harness bar and applying harness retention guide collars to hold the central strap in place. The rear strap can also be bolted to the rear mounting plate for one of the rear seat belts. Finally, there is an available adapter to allow the rear strap to clip into the rear seat belt buckle. Generally the Clubman should be used with aftermarket seats that have access holes for the shoulder belts (this avoids wrapping the shoulder belts over the seat back and putting a load, which the seat is not designed for, on the seat back mechanism).It may also work with some OEM seats that have flat tops and separate headrests, thus allowing the straps to pass over the seat without interference. With either of these options, we would recommend also using a harness bar like the one pictured above to route the harnesses through. Although you can install either without it, harness bars are always ideal with clubman-style harnesses, as they changed the belt’s approach angle into the back of the seat, making them far more effective. Even racing seats are not designed to take a load downward from the harnesses, and without a harness bar you are creating a sharp point on the harness pulling down on the harness holes, while routing the harness through a harness bar creates a smooth radius on a harness bar tube. Also, as there are no given attachment points on a car, the builder/installer will have to find the best route and location to mount the harness belts, and will include drilling and bolting the harness brackets in with proper backing plates and hardware. 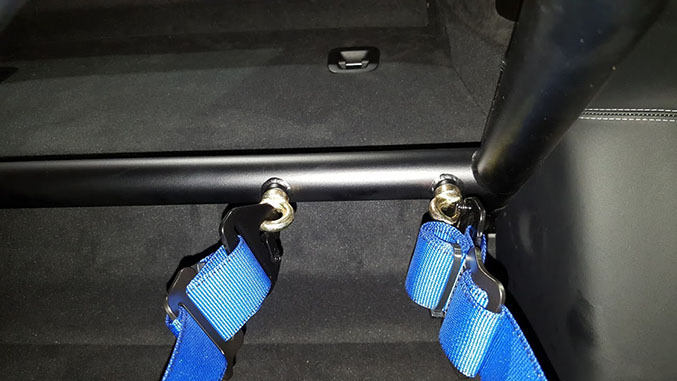 The other option is to find a harness bar that has provisions for eye bolts or bolt throughs like the GMG cage we just installed, pictured below. Our preferred harness bar manufacturers vary depending on the vehicle it’s being installed in – feel free to contact us for recommendations for your specific setup. 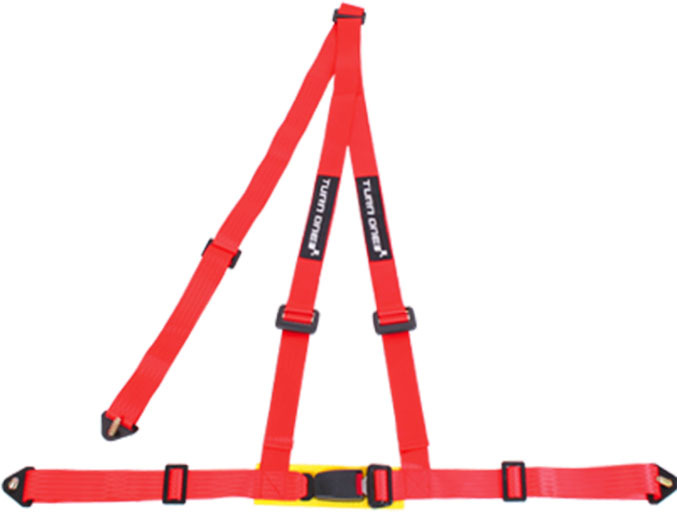 The Quick Fit Harness from Schroth is another option for people who have certain dual duty cars (track and street). The Quick-Fit is only used on track days; at other times you unclip it and use the factory 3-point belts. The Quick-Fit anchors to factory points, which means you don't have to worry about it ripping out of the sheet metal because the factory points are load tested to withstand a 3,000-pound force for 6 seconds. The Quick-Fit simply clips into the front (driver's right side) and rear (left and center) female buckles that are normally used for the factory belts. Then you add a male buckle on the driver's left side in parallel with the existing OEM 3-point belt. 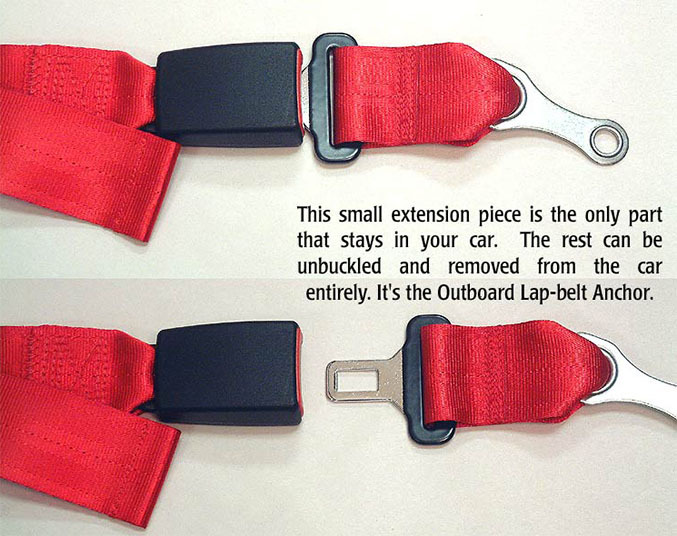 You can clip the Schroth Quick-Fit into you car at the track in about a minute. It has anti-submarine technology that keeps the lap belt low and your rear end firmly planted in the seat. The main obstacle with the Quick Fit solution is that the system is designed for specific makes and models, meaning that it isn’t currently available for some vehicles. Schroth currently has Quick Fit options for select models of Fords, Subarus, BMWs, VWs, Audis and Minis. If keeping yourself in place while at speed is your primary concern, there’s also a simple, temporary solution. The CG Lock is a clamp which attached to your vehicle’s existing three-point safety belt and gives you about 80% of the holding power of a full race harness. Once the CG-Lock is installed, you pull up on the shoulder harness of your seat belt, and the lap belt portion gets "racing harness tight" and stays as tight as you want until you release it. 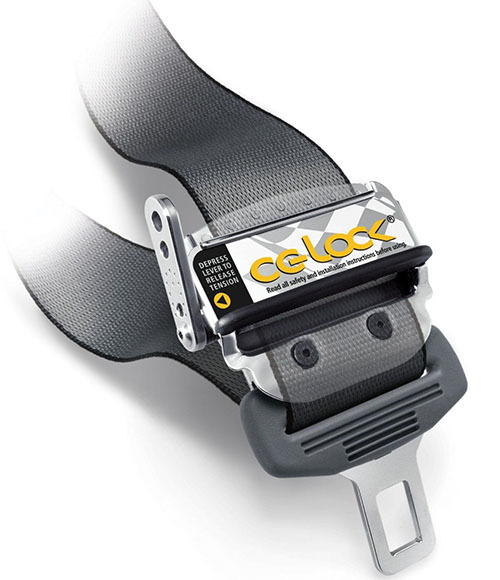 While it does not provide the same safety benefits as a proper harness, the CG Lock does help performance in that the driver will get the hold-in-place benefits of a racing harness, meaning they will not have to brace themselves against the steering wheel during braking and other high G-force maneuvering. A simple solution for the occasional track day or autocrossing session, this is a huge benefit to driver performance by preventing you from sliding around while on track. Shop Winding Road Racing's full line of racing seats and racing harnesses and restraints. Got questions? Drop us a line in the comments below, or feel free to contact us here.